He looks like a college basketball player at 6’3”, 195. He has all of the physical skills needed to be a star at the D-1 level. He handles the ball well. He can shoot the 3 ball as well as the mid-range jumper. Tim played behind sophomore shooting guard Lucciano Gamiz who is heading off with a university scholarship in hand. 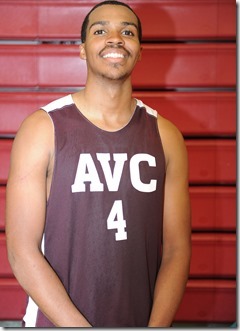 Gilmore was one of those unsung hero’s from last year who made the AVC team so deep and difficult to beat. If you ask Tim Gilmore weather he was satisfied with his freshman year, he will say no. It took him time to get comfortable with the complexity of the D-1 offense and defense style played by AVC. Building confidence was key and as the season wore on, you could see it build in Gilmore. Defense was improving as well. Its now up to Tim to step and take the open shooting guard for AVC. It won’t be easy as there are great players that will be ready to step in. As I said last year, Tim Gilmore could be the “sleeper” on this team who could lead them to another conference championship, the playoffs and win the state tournament. 23 February 2015 The “sleeper” sleeps no more. Gilmore with this energy, skills and aggressiveness, demanded that he start for AVC at the two guard. With his D-1 size, skills and Dean’s list academics, he quickly was renamed the “silent assassin” for his deadly shooting. Tim was named to the First Team All-Conference team in the Western State-South yesterday. Tim accepted an opportunity to join “Athletes in Action” for their yearly international basketball team tour in Puerto Rico in May-June before he joins his University squad this summer. Congratulations to Gilmore on this opportunity to gain international basketball experience. Tim was named to the first team all-conference squad this year. Dean’s List Tim Gilmore signed with D-2 Texas A & M International for a full ride scholarship. Its pretty clear why Tim Gilmore, 6’3”, 200 shooting guard will be successful in life. I received a note from Tim yesterday from Texas A&M International in Laredo Texas where he is studying on a full ride scholarship. Here is the gist of his note. Recently I fractured the base of my 5th metatarsal during a night practice we had about a week and a half ago. Its been diagnosed as a “Jones fracture” , so i will be flying home soon to schedule my surgery. It’s said that the recovery will take about 4-6 weeks after the surgery so hopefully mid to late January I should be practicing and working out with the team. So ultimately I will have to medical red shirt, which i believe won’t do anything but benefit me in the long run! This will allow me to study the system, focus on my studies, and get in the weight room and get stronger, not to mention be the best teammate I can be. Sounds like bad news i know, but I see it this way, I get my year back, and I’ll have 10 months after season to come back better and stronger, and a chance to have a great year!! MINOR SETBACK, MAJOR COMEBACK. When Tim Gilmore headed home after his first year at Texas A and M International where he fractured his foot in practice, he was thrilled to be home but even more happy to be healed. Tim couldn’t wait to get back to Texas A and M this fall and play his remaining two years of D-2 basketball. He kept working out of course the first couple of weeks he was home and during one of these workout he stepped down hard on the the same foot he fractured months earlier. it popped. His physician gave him the bad news, a crack in the bone in the same foot. Hard decisions needed to be made and it ended up to be another year away from basketball for Tim to make sure the foot was back to 100% for good. Tim will continue on his academics in the up and coming year and is expecting to head back to college basketball next year. Tim Gilmore continues his academics and is working part-time and continues to plan to head back to university basketball in the future. Tim Gilmore accepts basketball scholarship to NCAA Trinity International University outside of Chicago.